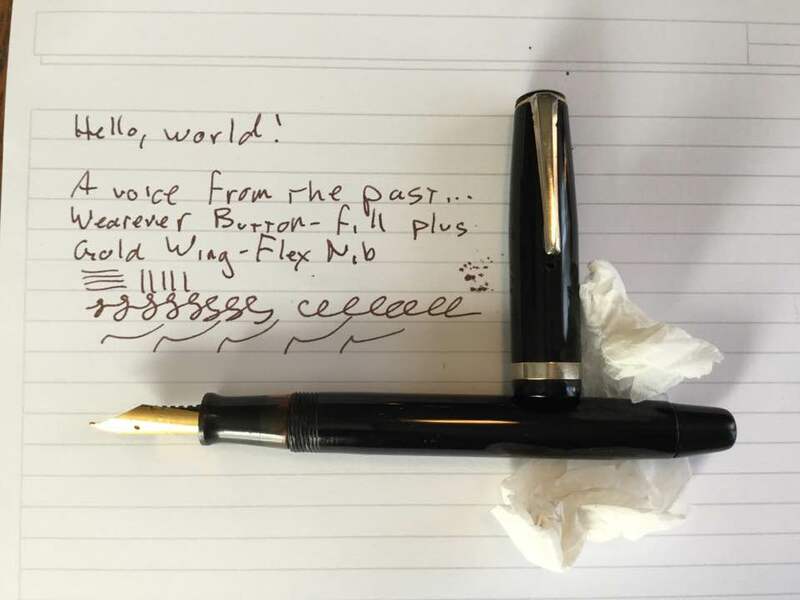 My pen restoration hobby is off to a good start. The Wearever button-filler that I wrote about here and here is now in the hands of Mrs. Sotto Voce, who is trying out some blue inks she bought for it. 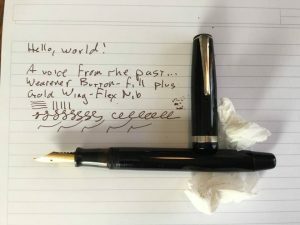 At the suggestion of Joe Van Cleave, I’m going to start making some short videos about my pen adventures, starting with a review of my “man cave” shed and my small pen collection. And I’ve started scouring pen market boards and flea markets for bargains. The other pen that I had to start with is an Esterbrook desk pen. I bought it because I wanted its heavy black-ceramic base for my desk, to match one I had picked up years before (one for my Parker “51,” and the other for a PaperMate Logo mechanical pencil). Because it’s a desk pen, it doesn’t have a cap, and its clear Lucite tail piece is long and slender. The nib was broken, but the cool thing about Esterbrooks (fans call them “Esties”) is that they use threaded nib units that can be swapped out easily, and the nibs — along with their little cardboard cases — are still plentiful and inexpensive. So that pen will likely be my first to sell or swap. I’m almost finished with it. The first pen that I bought specifically to restore, another Wearever button-filler, is my first real challenge. The eBay seller said that the button appeared to be loose, which usually indicates that the ink sac has degraded and the pressure bar has fallen out of the button — no problem. But when the pen arrived and I started poking and prodding, I soon discovered that the problem was more serious. The entire button assembly — a plastic doohickey glued into the end of the barrel designed to hold the button and the blind cap that covers it — had been snapped off entirely. The button was stuck in the doohickey, so my guess is that many years ago, someone pushed the button too hard in an effort to loosen it, and snap. 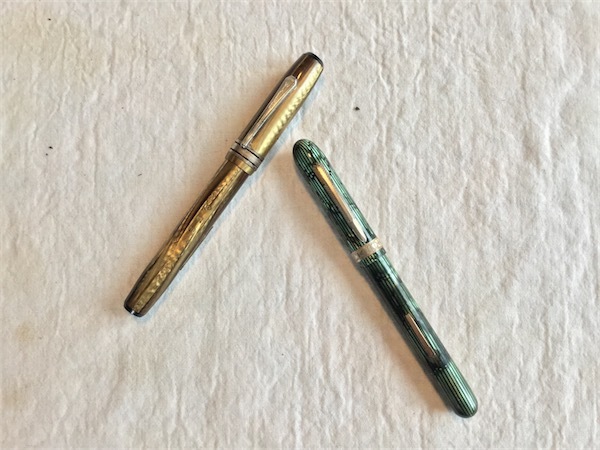 Talking to a pen expert about the situation, I learned that the piece can be re-glued using methyl ethyl ketone (MEK), but unfortunately it was too fragile and it quickly flaked apart, leaving me nothing to glue back in! Sure, I could put the pen aside until I find another Wearever button-filler that I could cannibalize by trying to carefully knock out its doohickey, but a) that’s risky and b) it kills another pen. So poking around some more, I learned that Ron Zorn of Main Street Pens fabricates replacement parts. So after corresponding with him about it, earlier this week I mailed the pen to him to take a look and see if he can fabricate a new doohickey. Now the cost of the replacement will outweigh the value of the pen by a couple orders of magnitude. Wearevers were the Bic sticks of their age, cheap throwaways that today can be bought for a few bucks as “practice pens” for beginners like me to make mistakes on as we practice our craft. So why spend so much money on it? I can’t explain it beyond the simple reason that I just like the pen. It’s utterly irrational and makes no market sense, I get that. But since the pen made it this far, doesn’t it deserve a little TLC? Every restoration hobbyist probably feels that way about their first project. I’m sure I’ll get more level-headed the more pens I fix, but in the meantime I’m just going to enjoy my sentimentality. And speaking of more pens to fix, my latest acquisitions arrived today. Another Wearever (a lever filler this time) and, on the right, a Majestic. No one seems to know much about Majestics except that they appeared in Sears catalogs, they are easy to restore, and the nibs tend to be wet and flexible. The barrel and cap are celluloid, not plastic, and the feed is apparently hard-rubber. This will be my first experience working with these materials. I’m excited! Mrs. Sotto Voce has already laid claim to the Majestic, in case you’re wondering. This is going to be fun. Looking forward to your adventure. I’ve not been confident enough to venture into taking any of my pens apart even though several need sacs or bladders. My desk pen is an old Esterbrook in one of those heavy glass art deco holders.